For other uses, see Third eye (disambiguation). In Dharmic spiritual traditions from India, the third eye refers to the ajna (or brow) chakra. The third eye refers to the gate that leads to inner realms and spaces of higher consciousness. In New Age spirituality, the third eye often symbolizes a state of enlightenment or the evocation of mental images having deeply personal spiritual or psychological significance. The third eye is often associated with religious visions, clairvoyance, the ability to observe chakras and auras, precognition, and out-of-body experiences. People who are claimed to have the capacity to utilize their third eyes are sometimes known as seers. 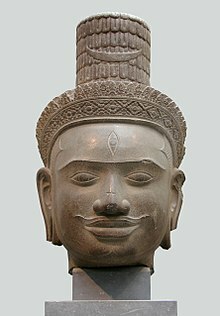 In Hinduism, the third eye is said to be located around the middle of the forehead, slightly above the junction of the eyebrows. In Taoism and many traditional Chinese religious sects such as Chan (called Zen in Japanese), "third eye training" involves focusing attention on the point between the eyebrows with the eyes closed, and while the body is in various qigong postures. The goal of this training is to allow students to tune into the correct "vibration" of the universe and gain a solid foundation on which to reach more advanced meditation levels. Taoism teaches that the third eye, also called the mind's eye, is situated between the two physical eyes, and expands up to the middle of the forehead when opened. Taoism claims that the third eye is one of the main energy centers of the body located at the sixth Chakra, forming a part of the main meridian, the line separating left and right hemispheres of the body. In Taoist alchemical traditions, the third eye is the frontal part of the "Upper Dan Tien" (upper cinnabar field) and is given the evocative name "muddy pellet". According to the Christian teaching of Father Richard Rohr, the concept of the third eye is a metaphor for non-dualistic thinking; the way the mystics see. In Rohr's concept, mystics employ the first eye (sensory input such as sight) and the second eye (the eye of reason, meditation, and reflection), "but they know not to confuse knowledge with depth, or mere correct information with the transformation of consciousness itself. The mystical gaze builds upon the first two eyes—and yet goes further." Rohr refers to this level of awareness as "having the mind of Christ". Adherents of theosophist H.P. Blavatsky have suggested that the third eye is in fact the partially dormant pineal gland, which resides between the two hemispheres of the brain. Reptiles and amphibians sense light via a third parietal eye—a structure associated with the pineal gland—which serves to regulate their circadian rhythms, and for navigation, as it can sense the polarization of light. C.W. Leadbeater claimed that by extending an "etheric tube" from the third eye, it is possible to develop microscopic and telescopic vision. It has been asserted by Stephen Phillips that the third eye's microscopic vision is capable of observing objects as small as quarks. According to this belief, humans had in far ancient times an actual third eye in the back of the head with a physical and spiritual function. Over time, as humans evolved, this eye atrophied and sunk into what today is known as the pineal gland. Dr. Rick Strassman has hypothesized that the pineal gland, which maintains light sensitivity, is responsible for the production and release of DMT (dimethyltryptamine), an entheogen which he believes possibly could be excreted in large quantities at the moments of birth and death. The use of the phrase mind's eye does not imply that there is a single or unitary place in the mind or brain where visual consciousness occurs. Philosophers such as Daniel Dennett have critiqued this view. The 1959 novel The Third Eye by Lobsang Rampa (born Cyril Henry Hoskin, 1910-1981, a native of Plympton, Devonshire) introduced a fictional account of the third eye for the first time to a wide popular audience of English-speaking readers. Wikimedia Commons has media related to Ajna chakra (third eye). ^ Richard Cavendish, ed. (1994). Man, Myth and Magic – Volume 19. New York, NY: Marshall Cavendish. p. 2606. ISBN 978-0839360353. ^ Saraswati, Swami Satyananda Saraswati (2001). Kundalini Tantra. Bihar, India: Yoga I Publications Trust. ISBN 978-8185787152. ^ a b Leadbeater, C.W. The Chakras Wheaton, Illinois, USA:1927 Theosophical Publishing House Page 79. ^ The doctrine of the elixir by R.B. Jefferson Coombe Springs Press 1982 chapter 4. The Archaic Anatomy of Individual Organs. ^ Rohr, Richard "The Naked Now: Learning to See as the Mystics See", The Crossroad Publishing Company, 2009, ISBN 0-8245-2543-4, ISBN 978-0-8245-2543-9. ^ H.P. Blavatsky, The Secret Doctrine, Vol. 2, 1888, ISBN 1-55700-124-3, pp. 289-306. ^ Phillips, Stephen Extrasensory Perception of Quarks Wheaton, Illinois, USA 1980 Theosophical Publishing House ISBN 978-0-8356-0227-3. ^ Helena Petrovna Blavatsky, The Secret Doctrine vol. II, (Wheaton, IL: Theosophical Publishing House, 1993), 295. Hale, Teresa (1999). The Book of Chakra Healing. New York: Sterling Publishing Company. ISBN 0-8069-2097-1. Radha, Siviananda (2004). Kundalini Yoga for the West. New York: Shambhala. ISBN 1-932018-04-2. Sagan, Samuel, M.D. (2007). Awakening the Third Eye (3rd ed). Roseville, N.S.W., Australia: Clairvision. ISBN 0-9586700-5-6. Sharp, Dr. Michael (2005). Dossier of the Ascension: A Practical Guide to Chakra Activation and Kundalini Awakening. St. Albert, Alberta: Avatar Publications. ISBN 0-9735379-3-0.